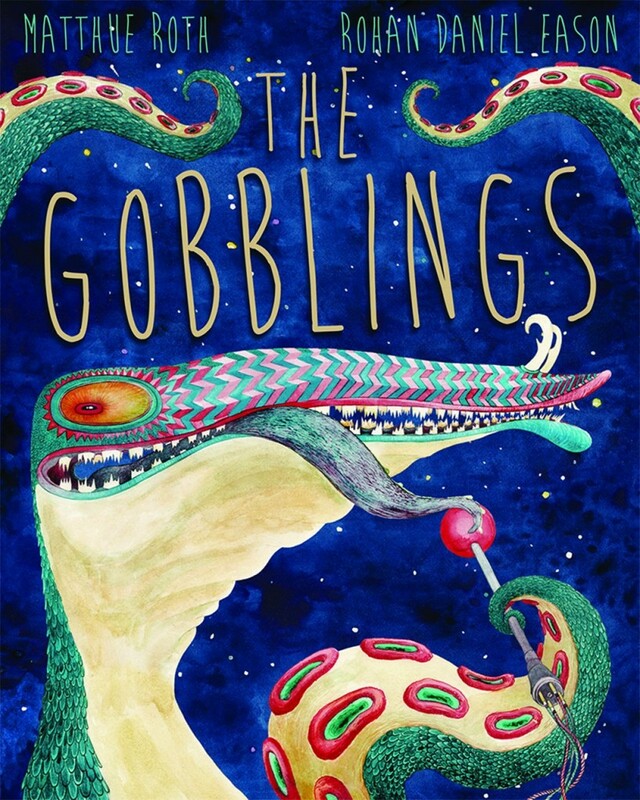 The Gobblings is a fascinating new children’s book written by Matthue Roth, and its story is filled with surprises. “Herbie didn’t like his new house very much at all,” the book begins, but its second page reveals that their house “was far off in space…” So yes, the nights really are very long and very cold, and all Herbie can see out his window is a gorgeous expanse of stars. Roth’s book is overflowing with exciting surprises, and it’s fun to see them all illustrated by Rohan Daniel Eason. Herbie sees shadows in the tunnels of the walls of the space station — inside of which were creatures “who also went unnoticed by the adults…” The story reminded me of Where the Wild Things Are, with a lonely boy making a matter-of-fact discovery of monsters. Rohan has been compared to Maurice Sendak, and I think it’s a fair comparison. His drawings are realistic while being stylized, and they manage to be both expessive and moody. In one drawing, Herbie pulls a red wagon with gears past the legs of the distant grown-ups, while under the floor crawl the purple tentacle creatures, huddled in a soft yellow glow. They’ve got pretty red stripes on their beaks — are they friends or foes? — and while Herbie builds himself some friends using robot parts, “the Gobblings” keep watching him!